Rolling Machine for single width up to 1 1/4 size papers. In addition to detailed instructions, this roller includes an extra rolling apron (the plastic part that wears out over time) so you know that it will last. Works good but it needed a apron and I could not find it since i moved. So far it works great. I'm just still trying to get used to it. One of my gfs was given one by her dad & said, "You gotta get one." I did & it's definitely worth it. Comes with a spare apron & instructions. Fits in the palm of my hand (and I have tiny hands) so it's the perfect size to fit into my Bag of Tricks with all my other stuff. 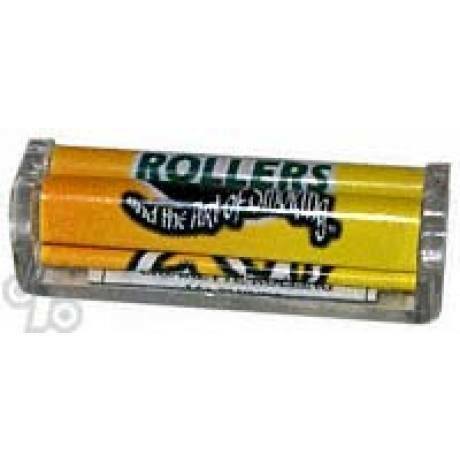 I always used to roll by hand until I tried the Zen roller. It's faster and easier and the cigarettes come out great. I'm hooked! It is a good product but does not give instructions on how to put on the other cover on it comes with. It's a rolling machine. Works well, sturdy. The belts (aprons) are replaceable and inexpensive but hard to find. 1% said they will be carrying the aprons but I haven't checked. Aprons last around 6 weeks before they get brittle or start coming apart at the seams with my level of use, in my climate. Recommended. Long-lasting, sturdy. Easy to replace sleeves.